It’s an unlikely story from an unlikely Olympian. Simidele Adeagbo, who goes by “Simi,” thought her athletic career and Olympic dream were over 10 years ago. An All-American track star with a slew of school records in long and triple jump from the University of Kentucky, Adeagbo missed qualifying in the triple jump at the 2008 Olympic trials by a mere 8 inches. And that could have been it. But nearly 10 years after she retired from the track, Adeagbo learned about an unusual opportunity in August 2017: the Nigerian bobsled and skeleton team was holding tryouts in Houston. 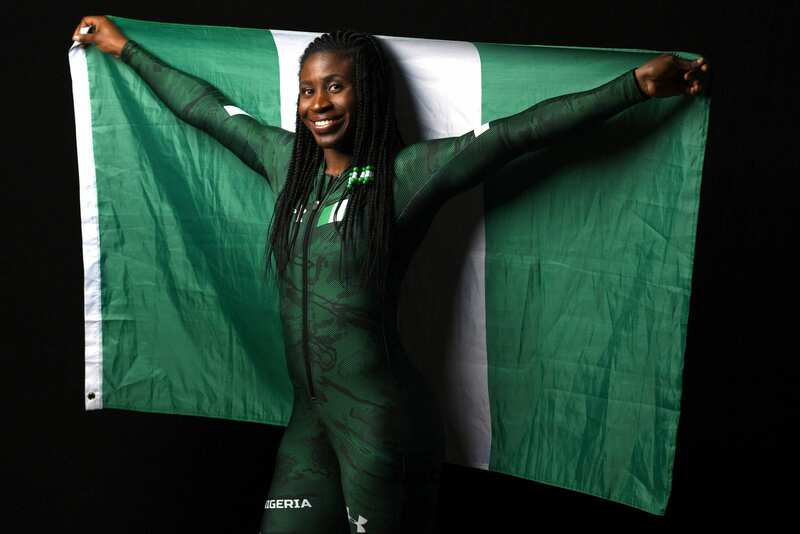 Born to Nigerian parents in Toronto, and having lived in Nigeria at one point in her life, the 36-year-old Adeagbo learned that she could represent Nigeria in Olympic competition. Why not? she thought, and flew to the U.S. from Johannesburg, South Africa, where she was working as a brand manager for Nike. Her athleticism and track experience paid off at the tryout: she performed well in the speed and strength tests, and was invited to a team camp in Calgary. Though it turned out the bobsled team was full, there was room in a sport she’d never heard of: skeleton. “I touched a skeleton sled for the first time ever September 12 of last year–2017,” she said in an interview with Wave 3 News. “I decided, you know what, I think I can do this. I see a lot of skills that I have from track and field that can transfer over to skeleton, I didn’t know much about the sport, but I thought somebody had to make history and why not me and why not now? As with any Olympic-level sport, Skeleton is much more difficult (and dangerous) then it looks. After a running start, skeleton athletes jump on a small sled, hurtling headfirst down a narrow ice track at speeds that can exceed 80mph. The racer with the fastest time wins. After completing six races on four different tracks, Adeagbo qualified, and headed to the 2018 Pyeongchang Olympics along with the other three female athletes representing Nigeria in the bobsleigh. Though none of the Nigerian athletes won a medal, their presence at the Olympics has been an inspiration across the world. “It’s definitely been a whirlwind, something I necessarily wasn’t planning for,” Adeagbo told Wave 3 News. Adeagbo was the first Nigerian, African and black female athlete to compete in skeleton at the Olympics, and the Nigerian team is the first team from an African country to compete in a winter Olympics. What sets Adeagbo and her athletic journey apart, however, is her steadfast faith. Raised in a Christian household, Adeagbo told the Press that her faith and relationship with Jesus grew during her time in college. She said that God’s presence has been apparent throughout her unexpected six month foray in skeleton and the Olympics.